The River Ailort flows for 5 km from Loch Eilt, one of the most photographed lochs in Scotland before joining the sea at Loch Ailort. 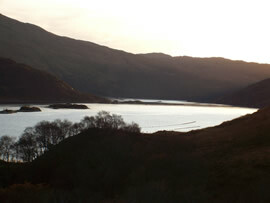 Around 500m below Loch Eilt is Lochan Dubh, the main resting place for sea trout and salmon on the river. The Ailort once supported one of Scotland’s premier sea trout fisheries. Rod catch data show a severe decline of sea trout took place in the late 1980s, culminating in a collapse of the fishery in 1989. 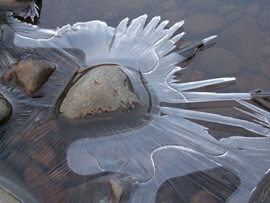 Sea trout numbers are recovering slowly, and the river is now mainly fished for salmon. The Fort William to Mallaig railway runs alongside picturesque Loch Eilt and the River Ailort, and the steam train The Jacobite can often be seen. 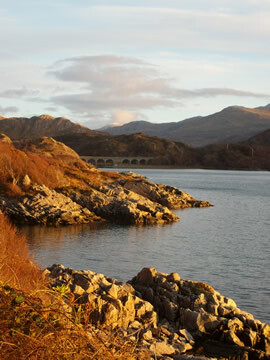 The journey to Mallaig was voted Top Railway Journey of 2009. Deer stalking is the principal land use in the area, and it is a good place to spot these magnificent beasts. Loch Ailort is a typical narrow, sheltered, west Highland sea loch which contains Scotland’s oldest salmon farm, which began operation in 1967.The farm is sited 1km from the mouth of the Ailort and is currently used as a research facility.